It is rare these days to get to celebrate permanent affordable housing wins in Durham. 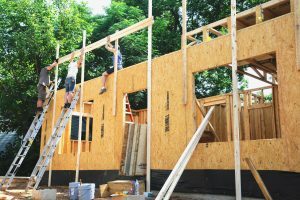 On April 10 at 4:00 pm, Durham Community Land Trustees (DCLT) will celebrate – with a host of nonprofit partners – the completed construction of two, new beautiful energy-efficient three-bedroom rental homes in the West End. These community-owned properties round out the Community Land Trust’s portfolio of 286 homes – both for rent and ownership – made permanently available for low-income residents for generations to come. “Today, it takes a village,” says DCLT Executive Director, Selina Mack “to finance and develop ONE permanently affordable home.” At this event, we will paint the picture of what it takes to build new affordable homes in Durham and celebrate the contributions of a ‘village’ of partners that successfully, though not without its challenges, acquired the land, financed, and built these two new, rental homes for the greater West End. DCLT, Habitat for Humanity of Durham, Bull City YouthBuild, Housing for New Hope, City of Durham, Self-Help Ventures Fund, Families Moving Forward, Durham Housing Authority and Duke University Office of Regional Affairs are the ‘village of partner’ organizations. EVENT DETAILS: Wednesday, April 10. 4 – 5:30 pm. LOCATION: Durham Coop Market, outside courtyard, 1111 W Chapel Hill St. Refreshments will be served. A celebratory cake will be cut. Brief remarks will be made by a few Bull City YouthBuild students and leaders from partner organizations to highlight their role in the ‘village of partners’ that made this partnership a success! Durham Community Land Trustees (DCLT) acquired the land on which these houses were built in 2016 from the Land Bank managed by Self-Help and Duke’s Office of Durham and Regional Affairs. The City of Durham, HUD and Self-Help Ventures Fund financed the construction. DCLT then contracted with Habitat for Humanity of Durham and Bull City YouthBuild to construct the homes for a cost well below market. 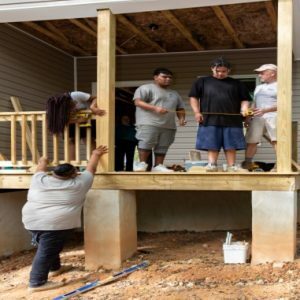 “To provide someone with a house to raise a family, while also giving our students an opportunity to learn construction skills that can change their life, is beyond amazing, it’s fulfilling,” said Cory Rawlinson, Program Director for Bull City YouthBuild. 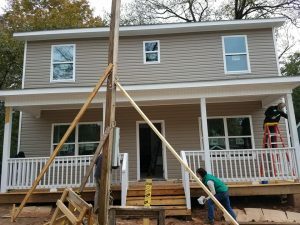 Starting in the Fall of 2018, a cohort of 21 YouthBuild participants, volunteer crews and contractors recruited and supervised by Habitat for Humanity of Durham, worked together to build the homes. 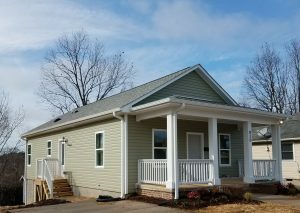 As soon as these homes were completed, DCLT worked with Families Moving Forward, Housing for New Hope and the Durham Housing Authority to match two families and make arrangement for their move-in to permanent new homes. One of the homes is now rented to a former homeless mother of two young children. She looked to Durham’s Families Moving Forward for temporary shelter. After 3 months in the shelter, she and her family were referred to Housing for New Hope to work with the Durham Housing Authority (DHA) to obtain a housing choice voucher which would help subsidize her rent. Meanwhile, DCLT reached out to Housing for New Hope as the next applicant on their waiting list for affordable rental housing. It’s not every day DCLT gets to offer a brand new three-bedroom house for rent or for sale! 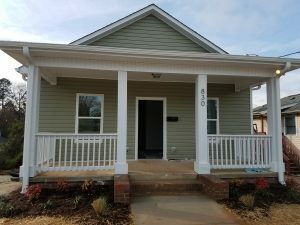 With DHA’s timely authorization of assistance to keep her rent affordable, this mother and her family moved into their new, permanently affordable home in the greater West End – one of Durham’s most convenient and more affordable neighborhoods in Durham today thanks to DCLT and its nonprofit ‘village’ of partners. For media interest and copies of photos, contact Kristen Cox at kcox@dclt.org or 919-490-0063.